Blackberries are a truly wonderful little fruit. Learn about the many great blackberry benefits, by eating this action-packed fruit regularly. Blackberries are a delicious and juicy fruit. This is why they’re also a great alternative to unhealthy drinks for those who love natural beverages. However, this is not the only way to take advantage of this fruit. They can also be included in a variety of salads, desserts, and similar recipes. Their unparalleled flavor is not the only argument in favor of choosing blackberries. This fruit provides the body with large quantities of fatty acids, vitamins, minerals and carbohydrates. In addition, they’re considered to be one of the healthiest natural antioxidants. Moreover, this fruit has very few calories. This makes it the ideal to add as part of a weight loss diets. Today, we’d like to take a look at some of the great blackberry benefits. All natural foods offer benefits to the body, and this fruit is no exception. Let’s take a look at them. Regularly consuming this fruit brings many benefits to those people who suffer from inflammatory diseases. Thanks to their contribution of nutrients, blackberries can be used to treat diseases such as arthritis or osteoarthritis. They even favor the treatment of hematomas caused by direct trauma and other inflammatory issues, no matter where they’re located in the body. If the benefit of this small fruit mentioned above surprised you, then surely the fact that blackberries are antioxidants will shock you even more. The best part is that you can enjoy both these benefits if you consume this fruit. If the treatment of inflammation in the body is not reason enough to include this fruit in your diet, then maybe knowing that this fruit helps combat free radicals will persuade you. Moreover, its antioxidant property stimulates the purification of toxins and other unfavorable substances. Thus, it’s responsible for providing skin care, as well as care to the circulatory system and other types of organs. In short, regularly eating this fruit detoxes the body optimally and naturally. There are many people who suffer from anemia all over the world and are unaware of this. In this case, the advantage of consuming this fruit lies in its high iron content. In fact, blackberries are one of the richest fruits in iron. Consuming them regularly not only helps to fight anemia, but also keeps blood platelets at an ideal number. Given that blackberries are a natural source of antioxidants, they help the body fight some cancer cells. Therefore, including this fruit in your regular diet decreases the likelihood of developing certain types of cancer. Although this was a simple theory at first, the University of Illinois (USA) carried out various studies that support this claim. In studies, it was affirmed that the type of cancer most affected by blackberries is stomach cancer. Many benefits of this small fruit are related to each other. A striking example of this is the way they fight fevers. 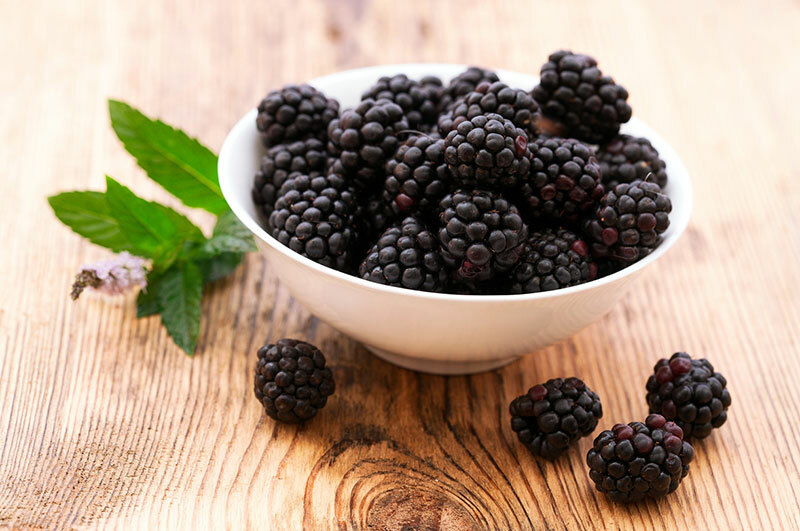 Due to their antioxidant power, blackberries attack the bacterial bodies that cause viruses. In short, it’s responsible for disinfecting the body. As with fever episodes, blackberries also have benefits with respect to the mouth cavity, specifically the teeth. Regularly consuming this fruit cleans and strengthens your teeth thanks to the effect that vitamin C has on bacteria. Furthermore, they prevent various ailments such as halitosis, plaque, and gum inflammation. The benefits of this fruit also depend on the type we consume. For example, green blackberries can be used to attack coughs. To take advantage of their properties to the maximum, it’s recommended to mix these berries with a little bit of honey. They help the body to stay properly hydrated. Blackberries function as a laxative. They help the brain function. Blackberries regulate blood cholesterol level. If you suffer from high blood pressure, you should consult a trusted doctor or a nutritionist before increasing your consumption of this fruit.